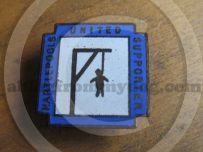 Hidden at the bottom of a box of assorted oddments passed through our dads family we have come across a small metal badge with the words ‘Hartlepools United Supporters’ painted on it and are keen to know more about it’s history. 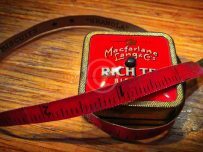 Around two centimetres square with rounded corners is a tape measure advertising a company called Macfarlane Lang & Co which mum has found in her sewing box. 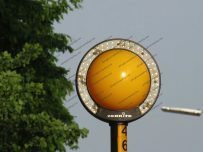 Something of a quiet revolution is taking place on the streets of Cumbria as revolutionary LED street lamps are being installed. 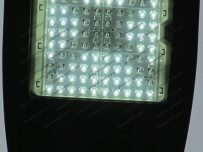 A Cumbrian zebra crossing has had a high tech upgrade with the installation of new low energy beacons. 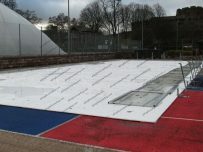 Situated on a little used tennis court in Carlisle a new synthetic ice rink in Carlisle could open in March. 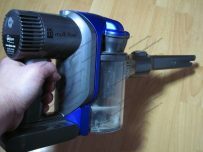 Mum has a new weapon in her cleaning arsenal with the arrival of a cable free Dyson DC-35 vacuum cleaner. 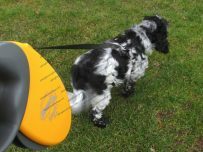 The excellent weather continues and to celebrate a new season of adventuring Charlie has a new Flexi lead. 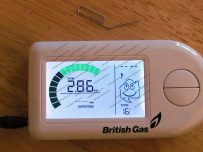 When our British Gas EnergySmart monitor stopped working dad had to ask for help as he could not work out how to reset it. 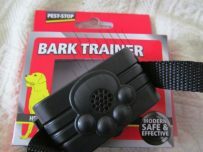 Thanks to the people at Pest-Stop we have been sent one of their electronic Bark Trainer units to test and review. We have had the unit a number of weeks now and sadly we have to say that they need to go back to the drawing board and think again. Mogambo motor yacht – serious goal planning! 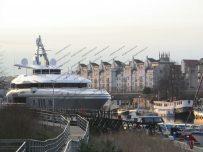 Motor yacht Mogambo seen visiting Bristol, UK recently for some last minute work before heading towards the Mediterranean.